Cancel Tabs Closing has got to be the most useless browser extension for Google Chrome to date. Its creators promote it as a program that will allow you to cancel browser tab closing with a click of a button which is silly since a tab is closed instantly with not waiting time. Clearly, the developers count on you not to remove because it, allegedly, offers a service that you will be unable to use anyway. It true purpose is unknown because it does not show advertisements, but does collect non-personally identifiable information about you that it can share with third parties. This program is not strictly malicious. Therefore, we classified it as a potentially unwanted program that you may or may not want to get rid of. The choice is up to you. However, if you want to find out more about this extension, please read this entire article. Cancel Tabs Closing comes from the same developers as Chrome Settings Button which is another useless Chrome extension that is nearly identical to this new one. However, the developers of both of these programs are unknown as the company name they provide is fake. Allegedly, the licensor of Cancel Tabs Closing is Canceltabsclosing.info which, incidentally, also the URL of the website that features this program’s download. You can also get this extension form the Chrome Web Store. The Store’s statistics show that this program currently has more than 6,000 users worldwide and this number is bound to increase as more people get tricked into downloading it thinking that it will somehow improve their browsing experience. Also, you can get this program accidentally because it is also distributed with the help of software bundles. Bundled software installers can install it on your PC by default and might not ask you whether you want to install it at all. Therefore, to avoid getting it, you have to select advanced or custom installation settings and uncheck its respective checkbox. If you get this program accidentally or intentionally, you will not reap the benefits of using it because there are not any. This program is utterly useless because its official and only feature is to cancel the closure of opened browser tabs which is not possible in the first place since tabs are closed instantly. Therefore, its stated function is nothing more than a gimmick. However, the problem is that this program can collect information about you. We believe that, like many browser extensions, Cancel Tabs Closing can get hold of technical information such as your IP address, Internet Service Provider (ISP) domain name, browser type, and operating system type. This information is typically used for showing personalized ads, but testing has shown that this extension shows no ads at all. Therefore, we assume that this program’s developers may sell this information to third parties, and these parties may not use this information for a noble cause. While Cancel Tabs Closing is not necessarily malicious, it is still a potentially unwanted program because it does not work and can collect information about you to be sold to unknown entities. There is no telling how the collected information will be used, but given the unreliability of this program’s developers, we do not recommend trusting this program. If you want to remove it, then please follow the instructions provided in the guide featured below. 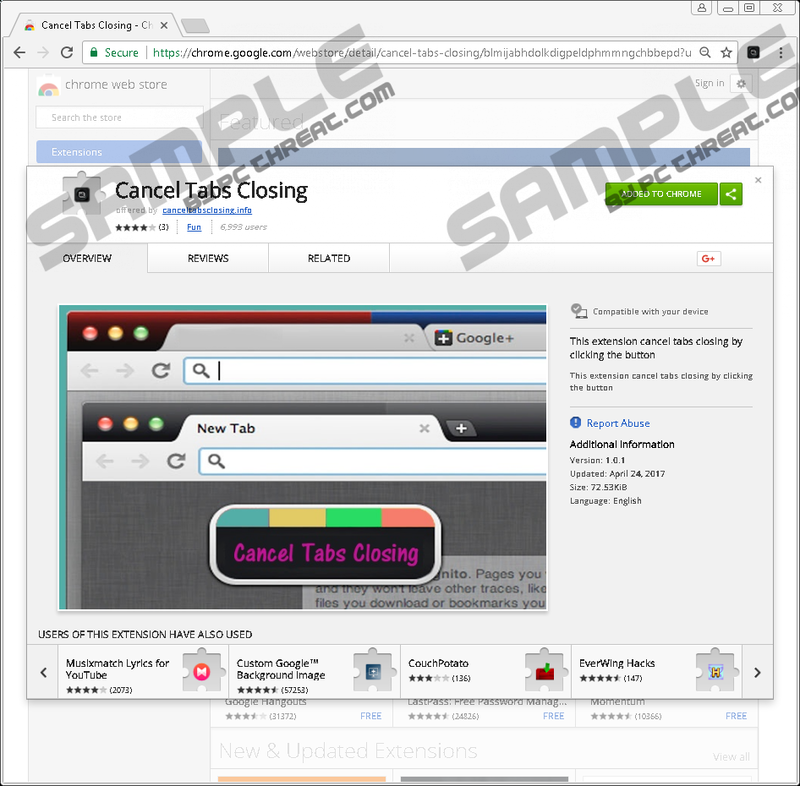 Quick & tested solution for Cancel Tabs Closing removal.